Following last week's reveal, Kia has presented its stunning new Proceed Concept to the world at the Frankfurt Motor Show to preview the next-generation Cee’d model family. Debuting as an all-new body type for the Korean automaker, Kia describes the Proceed Concept as an “extended hot hatch,” with stunning styling that incorporates a low roofline, muscular proportions and a Sharkblade in the bodywork that accentuates the lack of B-Pillars to create a photogenic profile. If the next-generation Kia Cee’d looks as good as this, we’re already sold - the Proceed Concept looks achingly pretty from every angle. The curvaceous show car currently on display at Frankfurt is finished in a bespoke Lava Red paintwork, which Kia says was created by combining multiple hand-applied layers of black, chrome effect silver, and red-tinted lacquer. It’s being shown off in a sporty GT specification, distinguished with large air vents at the front, 20-inch six-spoke wheels, and carbon fiber accents. For the first time, we also get a peek inside the Proceed Concept’s lavish interior, which looks just as swish as the exterior. Inspired by bespoke tailoring and haute couture, the cabin incorporates several high-quality materials in a striking mix of red and black and grey colors. The sumptuous seats are wrapped in hand-tailored, rippled black fabric, with hand-painted satin fabric lining the doors and flowing into the footwells. Rounding off the cabin’s plush features are dashboard controls finished in high quality knurled aluminum. “With many European drivers now seeking performance alternatives to the three-door hot hatch style, we began thinking about a different halo model for the cee’d family,” said Gregory Guillaume, Chief Designer Europe for Kia Motors. 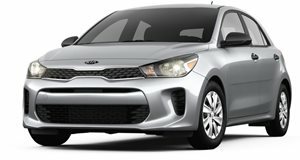 The completely redesigned 2012 KIa Rio 5-Door is a leaps and bounds improvement over its predecessor. Strain that little 1.6-liter engine and you’ll find a nirvana once thought impossible in this segment.